Here we kick off with Jonathan Stratt, popping up as a building site foreman speaking to Mo (Siobhan Redmond) in third series Between The Lines episode ‘Blooded’, about animal rights activists, big pharma and industrial espionage. Originally I was going to stick him in YGAS, but then after flicking through his IMDb entry, I realised it wasn’t so much an early bit part before his big break, so much as yet another bit part in a career mostly marked by bit parts; he was recognisable not for what he was soon to do, but by what he has always done: solid background work, a reliable supporting artiste. Just look through his CV: ten coppers, six cab drivers, two builders, a couple of military types, two robbers, a pair of doormen, a ‘spivvy passenger’, one generic heavy – and in six years of small parts in The Bill alone two Terrys, a Barry, a Dave and a Steve. Can you get any more everyman than that? 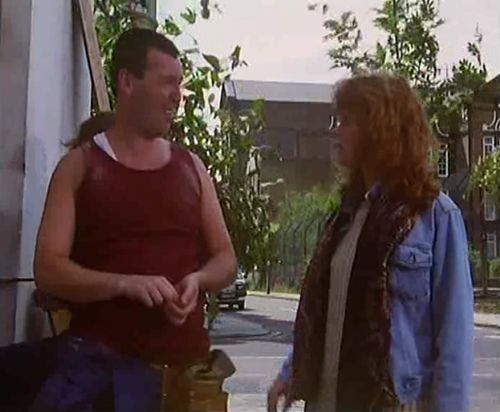 Of course, even the most humble of onscreen apparitions has their moment of fleeting glory, when face fits the part and character rubs off on the writers enough to toss their scriptmonkey the bone of recurrence, and I would say for Jonathan it would have been Brad Williams in EastEnders. Brad, you may remember, was Den Watts’ cut-out to The Firm, a low-level gangster given the job of acting as messenger between his mob bosses and their semi-tame pub landlord. He was also the one who burned down the Dagmar, and helped Den escape after the higher-ups in the Firm decided he needed to be got rid of and had him kidnapped pending whatever gruesome end they could devise for him – thus securing for Stratt a certain amount of importance in the canon, and nearly three years of occasional appearances as the same character. Why a solid professional like Jonathan Stratt hasn’t been offered more and meatier parts is perhaps a symptom of the perennial problem facing most actors; those considered too unflashy, too ‘ordinary’, or too working class (except in a to-be-laughed-at-sneeringly fashion) are almost always overlooked in favour of whizz-bang bourgeois types with a pretty smile and an ingratiating wit. A similar fate seems to have befallen the great Frank Harper, though at least Frank has had his occasional big day out (awesome in A Room For Romeo Brass, almost the only decent thing about South West Nine). If you’re out there, Jonathan, keep on keeping on! PS If you want to offer kudos to some unsung hero, let me know – post a comment, email me (it’s a test), or drop I a tweet.